Hunting (especially fox hunting) is a controversial issue. On the one hand animal rights groups protest that maiming and killing defenceless animals is inhumane. On the other hand, hunters argue that it is an essential part of traditional rural life, and that banning it altogether will collapse the infrastructure of life in the country. Here, we outline the arguments in favour of hunting. Fox hunting became popular in the 18th century. Before that, hunting hares, wild deer and wild boars were the main blood sports in Britain, but the extinction of the wild boars and the almost extinction of wild deer turned attention to foxes instead. Hunters often argue that protesters don’t have any idea of what a hunt actually involves, even going as far as to say they only turn up after the hunt has finished. They suggest that those who are against hunting should take the time to understand the exact nature of hunting before they air their views. According the League Against Cruel Sports (LACS), hunting provides jobs for around 750 people. Hunters argue that these people would be unemployed if hunting was banned. It’s not a huge amount in the grand scheme of UK employment, but it would undoubtedly be a big blow to those involved, who would obviously then need to find alternative ways to support themselves and their families. The British Field Sports Society (BFSS) suggest that more than 750 would be out of a job, but not of all these would be strictly unemployed, as jobs like horse riding and providing riding equipment and services would still be in demand. Pro-hunters claim that hunting and other blood sports are inevitable because of our biological make-up. To them, death and suffering are an unavoidable part of life, and the foxes would die anyway. Hunters claim that if you eat meat, you have no right to offer arguments against hunting. As far as they are concerned, meat eaters who oppose hunting are hypocritical. There can be no doubt that animals are killed for meat, but not all forms of blood sport involve the hunted animals dying. Wearing leather and other materials that are made from animals can also be seen as hypocritical. Pro-hunters reckon that foxes and other hunted animals don’t actually suffer during a hunt. Hunters argue that foxes are a nuisance and run amok in rural areas, killing and maiming large numbers of chicken and lamb. This is one of their arguments for why fox hunting in particular is so common in the countryside. The majority of the police are not trained to be able to police hunts, and so would not be in a position to make sure that no hunts take place anywhere in the UK. These arguments are some of the main ones put forward by those in favour of hunting (particularly fox hunting) to justify why hunting is such as a common activity in rural areas. See our article entitled Arguments Against Hunting for the arguments put forward by those in favour of a total ban on hunting. I’ve lived in a city all my life but I support the hunters simply because the saboteurs are such as self righteous bunch of virtue signalling morons. They go on about fox hunting being illegal so they film and harass participants. Trying to enter the uk without a visa is illegal but they don’t go to Calais to film that, in fact I bet that bunch of jellyfish liberals approve of it. I want to support a hunt and go along where can I find my nearest and when is the season? By the way in my part of London foxes are a nuisance, no need to chase them the bggers face you down in the street! Is it true that the hounds are horribly treated?There are a lot of reports that seem to indicate that the life of a foxhound is horrible. Addressing the comment below..raising animals to be killed is far more disgusting that going out and hunting. Somethings whole existence, being trapped, fed non-nutritional food.. gathering disease from being in confined spaces with an abundance of animals, is better than a free animal living peacefully and freely up until its death? I don’t understand that logic? Why do you use 'bagged foxes' then? Why do some Hunts breed their own foxes in order to hunt them? Why do some Hunts breed foxes in order to throw live Cubs into the kennels in order to train up young hounds to give them the taste of blood and a scent to recognise? It's all recorded on film in case you're thinking of denying it all. Fox Hunting is done simply to enjoy the chase and the kill of an animal. Stop trying to dress it up. From the strictly ethical environmental point of view there is no problem compared to the factory farming of animals, fox hunting is no worse. I wonder if this is why so many want to keep it, because what next? animal farming standards will be improved and pig farming could be banned... The problem with fox hunting is that it shows humans to be the creatures we are.In some ways the annual reminder of our cruelty, as the TV shows the boxing day hunts and those trying to disrupt events is not something that we really want. I suspect that a reintroduction of fox hunting is not in the rural communities interests, it will bring the spotlight back to cruel practices and inflame the sensitive townies further. Perhaps we should let sleeping dogs lie. Imagine...suddenly you are running for your life.you dont know why, but they're trying to kill you.You are scared.They're catching up fast.You're running slower now.Then suddenly your life flashes before yuor eyes.Yuo see your children,alone and scared.Then BANG! Yuo fall. Yes,foxes have been a cause of injury in the past.Yes, protestors against fox hunting have caused injuries. yes, hunting does bring a rider closer to their horse.But No ,those foxes don't see being hunted as a sport.They actually feel the pain of a bullet lodged in their body. I hate fox hunting. The fox NEVER has a chance to get away. A cow being led to slaughter has (hopefully) lived a carefree and happy lifestyle. It will be pain free when it humanly dies and the meat will be used. 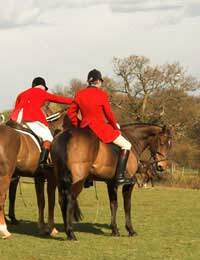 A fox will get terrorised as it gets chased for up to 5 hours by sad little men and women on horses who obviously can’t participate in any proper sport where their opponent has a chance at winning. The dogs who will most probably have been mis-treated will eventually get the fox and tear it apart to shreds. Explain to me where the benefit in this is? Except for making the men think they are big and strong where they lack these features in .... other areas. It’ll be a sport when the fox has a horse, a gun and a pack of bloodthirsty dogs to fight back at you. I say to people who like fox hunting - Get into a proper sport and stop being such a coward! we are against the idea of fox hunting because what the heck have the poor animals ever do to you? naff-all! I completely understand the points of view of anti-hunt supporters, why would people kill animals for fun? How can they enjoy this? What about animal rights? Well, fox hunting is part of our culture, England is slowly losing its cultural identity. I personally would love to see a repeal to this act! I don't hunt, nor would I want to, but since the hunting act has been in place I have seen far more 'tame' foxes around the country side, foxes are losing their instinctive fear of humans which, ironically, keeps them alive! Also, dedoite the repeal many many foxes are still being killed but through more torturous means, they are shot and bleed to death (as a one shot kill is hard on a moving target) or wait for infection, caught in trapsor snares and wait in terror for their assailants to arrive or are poisoned and die in excruciating pain. Please tell me how these can be perceived as more humane than a quick death, after a chase which gave the fox the chance to live? Furthermore, fox numbers are on the rise which means more farm animals and pets are at risk, where is the animal welfare for these the beasts prey? More foxes now will die of infection and disease which can easily be passed on to live stock and enter our food chains. People demand free range eggs, so do I, but so many chickens and other poultry have become victims to the harmless and supposedly innocent fox that poultry farmers are on the decline, where will we get our eggs from when they are all gone? We huntedall of the foxes predators and are living with the consequences, but to ban fox hunting is a mistake. It is a way of country life that creates local jobs, provides a day out where spread-out communities can join together and celebrate. To remove the kill is mocking their culture, just because you may live in a city does not put you above us. We are all equal and if this ban doesn't affect you, please stay out of it. The fact that a repeal is supported by the Countryside Alliance and the RSPB says a lot. An increase in fox numbers will decrease species diversity across the countryside. At the end of the day the fox is charming and charismatic, but don't let that fool you as it is a ruthless killer underneath. I'm ashamed you're a part of the human race also Mr. Johnny_Wishbone. Why wouldn't they post your RANT, you not going to to more than complaint with words, so it changes nothing and gives us a laugh. Hunting keeps certain species from starving and protects livestock so you can have your hamburgers. Also, most hunters DO eat what they kill, I ALWAYS do. ?? I by hunting fox with dogs they die in the same manner as their prey, only fair I believe. They go down with their honor intact. I don't agree with the gentleman's comment on putting dogs on badgers though, unless you don't care much for your dogs. They thick hide, very sharp teeth, and can Easily win a battle against a couple of hunting dogs. I don't participate in fox hunting but I understand the need for rogue foxes to be dispatched. What I don't understand is the anti-hunt argument that we must ban fox hunting because it is cruel and inhumane to hunt with dogs.In my previous experience it is actually the quickest way to kill.BUT where are all these ANTI's protesting that ratting is cruel?Rats are hunted with dogs but there are no SABs fighting for the rat.If hunting with dogs is cruel why not shout out for the rats?....Ahhh yes, but rats carry disease....They do but the validity of the 'cruelty' argument has gone if its ok to kill rats but not foxes. Badgers also carry disease... so where does the argument go from there.From my understanding Hunting foxes with dogs is cruel Hunting rats with dogs is ignored because they carry disease Badgers carry disease too but 'that's different' What does make my blood boil though is SABs thinking that they have the right to viciously attack people who have used their human rights to participate for whatever reason in a legal pursuit.The SABs have injured and occasionally killed hounds and horses alike (so their animal welfare argument is out of the window again) but they provoke and incite violence while hiding their identities through balaclava wearing.They hide because what they do is illegal and they wish to avoid prosecution for their crimes. @Dan. You can still get wild deer and wild boar in Britain. The difference between deer/boar and foxes is that they make good food - can't say that about foxes. Will it really matter if foxes become extinct? They are mostly predators and do not have any natural predators to worry about themselves (hence human involvement). Agree there must be a more humane way of hunting them and better rules in place for doing so (just as there are with boar and deer). And I'm not a Tory or posh or rich. I wouldn't want to be hunted down by a pack of dogs and ripped apart. But I eat meat, I wear leather, I wouldn't want to be raised in a shed all my life and sent to the slaughter house with my siblings either - my point is, if you eat meat or use any products that contain animal parts or were tested on animals, don't be so bloody hypocritical!!!!! Duh. Also, it is legal for farmers and gamekeepers to use a couple of dogs to flush out a fox to shoot. I'd rather a quick death-by-dog than shot in the back leg and limp around the countryside slowly getting weaker. Which is what happens .. If (if because often the fit foxes get away) the fox is caught by the dogs, it always dies relatively fast. But foxes that get shot often DON'T die straight away and either starve or slowly die from their injuries. To all those who talk about lock chickens and lambs in so the foxes can't get at them, right okay... give a hungry fox a few inches gap or weak fencing, they'll be in there. A fox will enter, say, a chicken pen . It will kill ALL the chickens. It will eat or take 1 or 2 chickens. One more point to people who think we'll hunt foxes into extinction, they BREED LIKE RABBITS. You non-rural people should go and see where your meat and vegetables comes from and the procedures involved. If you don't like the idea of fox hunting you would not eat meat again. Hypocritical fools. Fox hunting represents a tiny part of the rural economy, enjoyed by an even tinier minority of people. Most of us think the sport is morally indefensible, so why are the Tories trying to repeal the ban? It's a testament to the unequal distribution of power (i.e. money) in this country that there is any discussion at all on this point. 'wild deer and wild boars were the main blood sports in Britain, but the extinction of the wild boars and the almost extinction of wild deer turned attention to foxes instead'. After hunting one species to extinction and one to near extinction, do you not think the same will happen to foxes? Damn you people are stupid. Lynn said "Just a reminder that "Foxes are vermin" for those that seem to forget!" You're vermin :) See, it's a meaningless statement. We can decide what we call vermin and our definition of it and then use that subjective position as fact to prove our own case. Hunting and killing things isn't very nice. Even if at times necessary, but the very fact you have no compassion or empathy for another living creature, the very fact you think you are better than a fox, makes my statement accurate. There are very few things invented in the 1700s that cannot be improved on or changed. We weren't a very friendly lot back then. Did you know, when 'sport' hunting like this became popular, we were still burning witches...funny eh...perhaps we should carry on with that tradition as well. Fox hunting has absolutely nothing to do with controlling the fox population. In fact the last thing any hunt wants is a reduction in fox numbers, then there would be fewer foxes for them to hunt. The discovery of sixteen fox cubs being kept in a barn, specifically to be hunted nails the lie. Just a reminder that "Foxes are vermin" for those that seem to forget! I am appalled and shocked to the core that people actually think that hunting defenceless animals is a 'sport' and that we should re-instate it so that it is legalised within post-modern Britain! What barbaric and degenerate society are we currently living in? I have read many manifestos and arguments as to why certain 'humans' want to bring back animal slaying ..... and I am still in ultimate dismay that these people are living amongst us! You say 'Tradition'........... it was traditional to make young children work in factory's-being crushed by heavy machinery- I suppose who cares these children they are similar to animals? Dirty, uneducated and a burden on society? And how about woman voting?the list is endless, the thing is we have moved forward in society and come to understand that these 'old' unjust ways are stupid. Fox's eat animals................. Last time I checked a fox could not get on all twos' and open a metal gate- imagine my shock when I found out that some actually can (not). how about in today's world you just use a lock and gate, fancy that. As for sheep - why not have it fenced off? We are overpopulated- I feel the same way towards these murdered but you do not see me jumping on my horse, chasing them down and torturing them to death. Have you considered the mentality of the dogs? What if one of these trained pups decided to turn on the child of the hunter? Mauling its face to death - the dog would be sent to the killing rooms! To those who are in support of this felony - I wish you every painful disease going and then at the last minute a slow, treacherous death. Hunting is done for a reason, because foxes eat chickens and lambs which farmers need to produce things for the community. People say ban hunting however it is still okay to shoot pheasants for no reason whatsoever! Also hunting isn't a mass killing tradition, it's simply getting rid of a few harmful animals!